I don’t know about you, but I can’t suffer through too many mouthfuls of greens without some kind of dressing to jazz it up. Honestly, I suspect most people who claim to love munching on raw spinach would prefer to slather it in dressing — even if a little olive oil is all we’re talking about. So, even though I shamelessly keep multiple bottles of Primal Kitchen’s dressings around, the world can only benefit from more salad dressing recipes. Growing up, mustard was solely used as a condiment for burgers and hot dogs. But once I began venturing into cooking as an adult, I soon realized that mustard also makes a brilliant ingredient. Mustard is made with vinegar —a very basic mustard recipe is vinegar, mustard seeds, and turmeric. Because of that, you can add a little zing to sauces, marinades, and dressings with mustard. Then we get to chives. Chives are an allium, related to garlic, onions, and leeks. They have the most gorgeous, delicate purple flowers! This herb is easy to grow at home, and I like to have a plant around all summer so I can quickly snip off a bit of garnish. Chives are rich in vitamins A and C, which is reason enough to keep them around. People seem to discount the treasure trove of micronutrients that herbs have, which is why I tend to load up on ’em! Anyway. 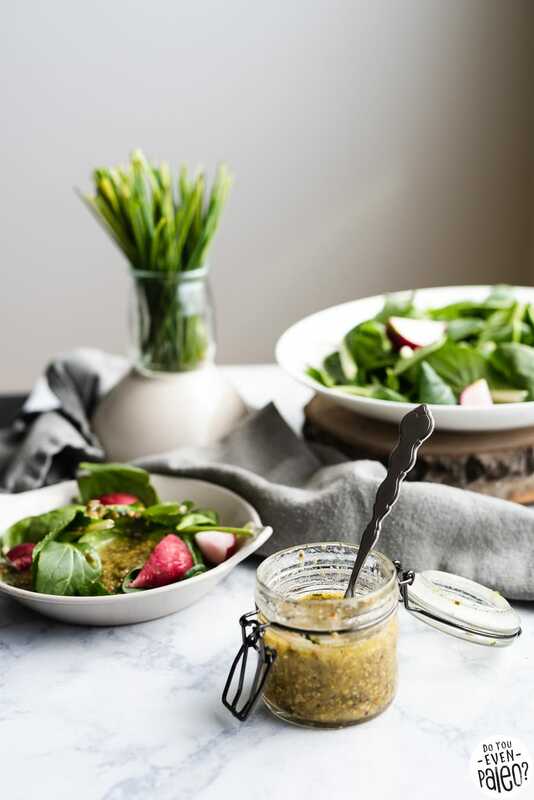 Back to the topic at hand… Make this vinaigrette recipe for the vinegary mustard and mild garlic taste of chives. Load up those summer salads and let’s eat all the nourishing things! I prefer my salad dressings to be punchy and tangy. 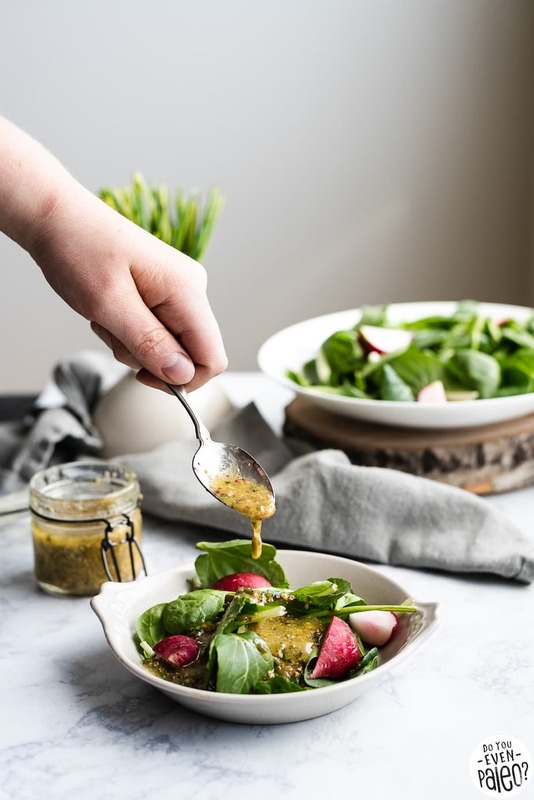 But if you find the acid is a little to strong for this mustard chive vinaigrette recipe, simply add more olive oil one tablespoon at a time. 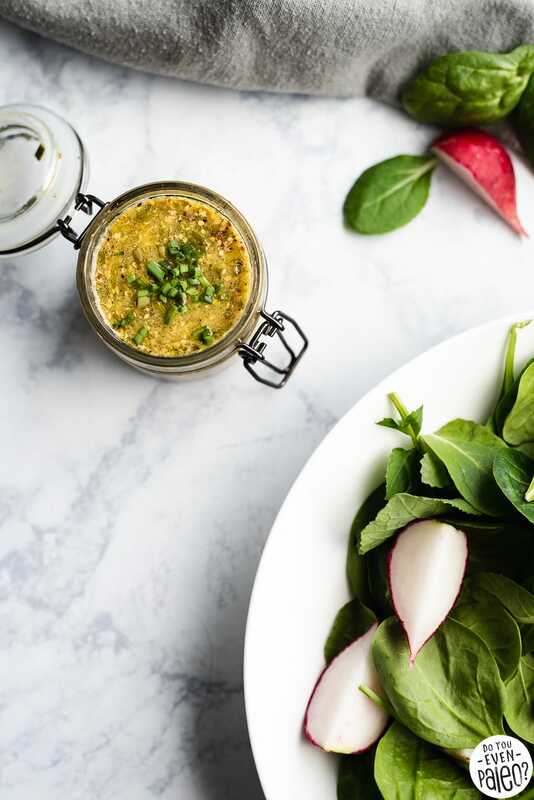 This zesty mustard chive vinaigrette is the perfect salad dressing for all your summer salads. It’s gluten free, paleo, and vegan. 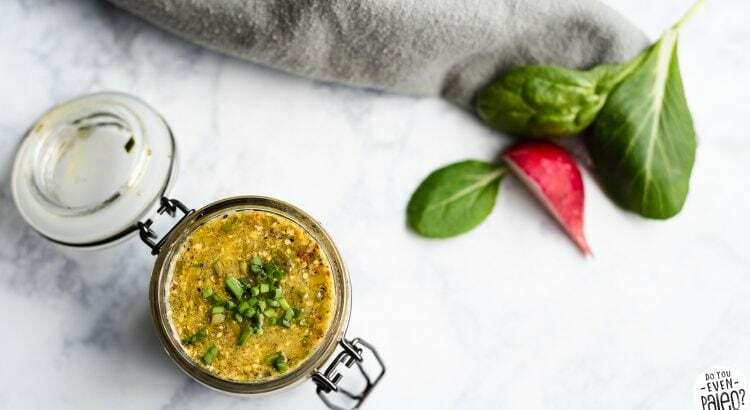 Mix apple cider vinegar, lemon juice, stone-ground mustard, and chives in a jar. Gradually add olive oil while whisking to emulsify the vinaigrette. Season with salt and pepper. Cover and store in the fridge until use. I prefer my salad dressings to be punchy and tangy, but if you find it overpowering you can add more olive oil! This is a brilliant idea and we’re trying this tonight. 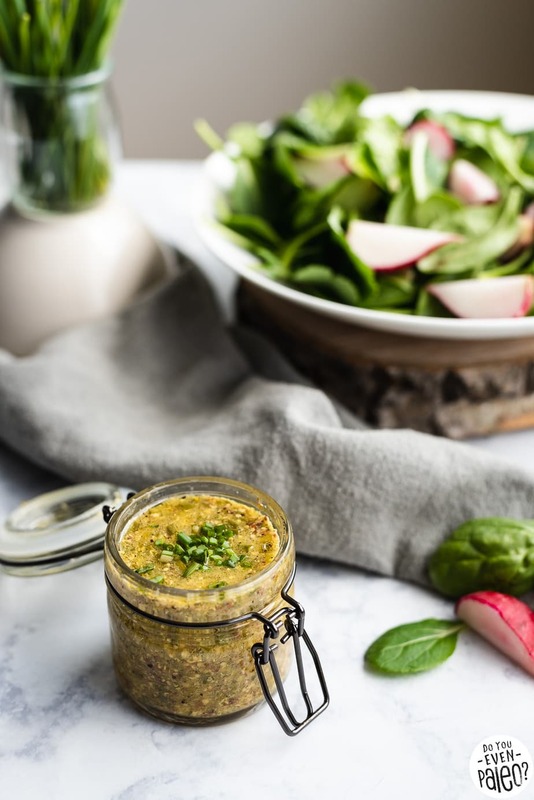 Thank you so much for sharing this mustard chive vinaigrette. Hey, Noemie! I kept mine in the fridge for 2-3 weeks and it was fine! I whisked it up before each use, though. The chives lose their color after a couple days. Don't subscribe All Replies to my comments Notify me of followup comments via e-mail. You can also <a href='https://www.doyouevenpaleo.net/comment-subscriptions/?srp=2918&srk=87505361eee98908ddf6ccb8681f50d6&sra=s&srsrc=f'>subscribe</a> without commenting.